I'm tending indoor seedlings and laying out the garden -- in my head -- this weekend. It's pretty amazing how nature managed to surrender itself to an impressive deep freeze and an equally amazing turnaround. Lemon balm, catnip, chives, oregano and peppermint are all up in my garden and looking pretty happy. I'm not taking any chances, though. I've started more seeds than I have in past years in case of losses from the heavy late winter cold weather. The frost free date for my area is the first Saturday in May (the running of the Kentucky Derby). I'm getting some of my seeds in a bit late for that planting date, but that's partly because of shipping delays from one of my suppliers. I started my collections right after Christmas. As I accumulated the above, I added them to freezer bags, one for each type (banana, egg, etc). 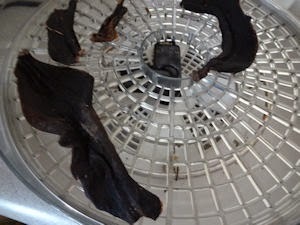 When I have a goodly amount, I'll dry them in a dehydrator and grind them up. That way they'll be ready to go. I'll just place a couple of spoonfuls in the planting hole with some potting soil and fill the rest of the hole with regular potting mix and a lucky seedling. I've done this a couple of times, and it works well. The roots grow into the extra bounty, like a care package from the garden, sometime in June. I alter the mixture for different plants, giving more of the shellfish, say, to heavy feeders. You get the idea. The process isn't very labor intensive, and it's pretty fun. I make use of my veggie and herb patch year after year, so a little giving back to the soil is in order. I especially like the idea of replenishing trace elements that aren't well represented in most potting mixes and many other additives. My short-cut composting helps, along with regular composting when I can get around to it. I also add Epsom salt (hydrated magnesium sulfate) to my tomatoes, peppers and roses. A combination of magnesium and sulfur, Epsom salt is a cheap additive. The magnesium can be particularly beneficial to vegetables like tomatoes and peppers, and is easily absorbed when diluted and applied directly to plant leaves (2 tbsp. per gallon of water). Epsom salt enhances photosynthesis, for greener leaves and more robust plants, and helps reduce the occurrence of blossom end rot in tomatoes. Additives change soil composition, so it's always a good idea to have your soil tested before you start tinkering with it. If you have an overabundance of calcium, for instance, adding egg shells is just silly, same for adding potassium if you have plenty. Take look at the catnip photo at the top of this post. That tiny mound is my secret weapon against all manner of pests. Fresh catnip smells a little like skunk, and most insects really do not like it. When you plant it downwind of your garden, you'll have fewer insect visitors, and those that do venture in won't be as enthusiastic about staying. Once dried, catnip loses the funky aroma, which is great if you love catnip tea. I have catnip plants all around and through my vegetable patch. If I'm having a particular problem later in the year, I'll even cut long catnip stems and place them around vulnerable plants, or blend fresh catnip and water into a smoothie and pour it on and around plants. If you have problems with mosquitoes near your deck or patio, a little catnip can help there, too. In some tests, catnip has outperformed DEET 10 to 1 at repelling mosquitoes. Although it can be invasive, and self-seeds readily, I let catnip grow where it wants and just relocate (or discard) any extra. This herb in the mint family doesn't root very deeply and comes up with a simple twist of the wrist. In a walk around the garden, I took a few photos and have included them. Reemerging plants are pretty beguiling, even for a seasoned gardener. 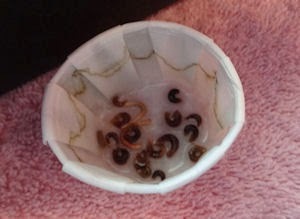 Here's an oldie, but a goodie: Soak your seeds overnight before planting them. They'll sprout faster and may even be more robust, especially if you've hand them over a year. I'm using craft sticks and permanent marker for my plant identifiers (cut in half crosswise) this year. They seem to be working, with fewer ink (running) problems this time around. Oh, I did want to mention that I had some good luck with early tomatoes last season. The two varieties I tried, Fireworks and Siletz (60 to 65 days, I think), were either open pollinated or heirloom varieties. I liked them so much, I'm using them again. Ahh, you make me think spring! Olga, back in February, I though spring would never come! But here it is. Is there a difference between catnip and catmint? Catnip is a catmint, but not all catmints are catnip. Some varieties are more attractive, less rangy in appearance, and more suitable for, say, a border. Catnip reigns supreme when it comes to attracting felines and intoxicating them, though. All are members of the mint family of plants, which includes lemon balm and peppermint. Hope this helps.